"The Taylors of Dunkerron", Gerard J. Lyne and Daniel Moriarty, Journal of the KAHS no.17, 1984. Deed, George Cashel of Shallee, [LR] 1863, 17 208. Deed, George Cashel of Shallee to GSWR, dated 19 Nov 1863, [LR] 1863, 40 239. 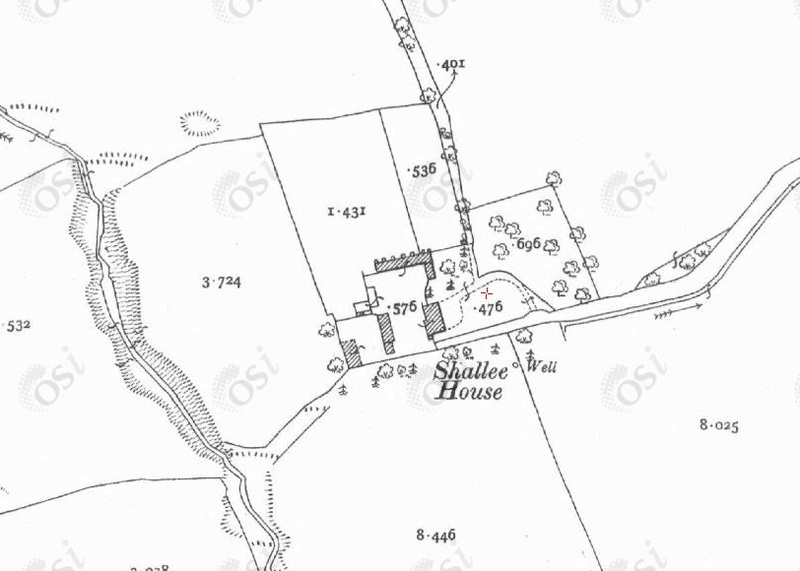 Shallee House, Co.Tipperary, in 1887 to 1913 map. subaltern officer of 6th Garrison Battalion. He mar 1812, at Ardfert, Co.Kerry, to Jane Joice Gun [descendant of Edward III]. See Limerick Gazette, 4 Dec 1812. At mar he is described as Lieutenant "R. Cashell" of the 31st Regiment. Note that James Cashell was of the 31st Foot in 1807-11. Note that the 2nd Battalion of the 31st Foot was in Ireland 1807-08. Robert is not listed in 6th Garrison Battalion or 31st Foot in [Army List, Nov 1812]. Jane remarried. See DENNY in [Foster's Royal Descents, 1887]. (todo) see 13th Report of the Deputy Keeper of Public Records, Appendix, p.109. bapt 27 December 1818 [St.Mary's C of I, Dublin]. there were similar exertions by other relatives of Rowan. think will burnt in Four Courts 1922.
acquitted of murder 1816 amid great controversy. At least one other son, Cashel. A "George Cashel" appears in [Vestry Minutes Books, Tralee church] in Apr 1806. "George Cashel" in [Vestry Minutes Books, Tralee church] in Mar 1807. "George Cashel" in [Vestry Minutes Books, Tralee church] in Apr 1810. "George Cashel" in [Vestry Minutes Books, Tralee church] in Apr 1811. 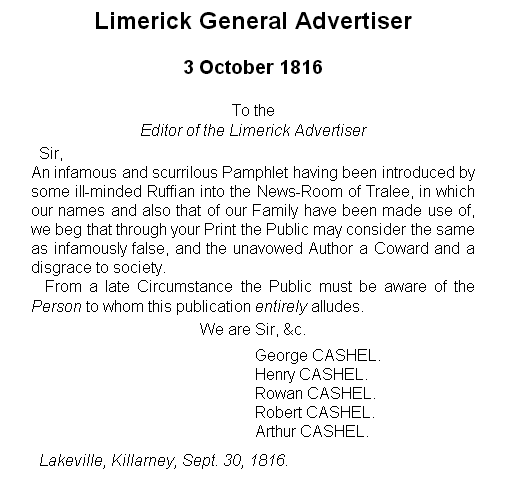 Notice by the Cashel family in Limerick General Advertiser, 3 October 1816, in response to the [O'Connor pamphlet about the duel, 1816]. Looks like there might be 5 brothers - George, Henry, Rowan, Robert, Arthur. Some Cashels of Shallee, Co.Tipperary, went to New Zealand (see below). But other Cashels stayed in Shallee. mar 1836 [Diocese of Cork and Ross] to Susanna Going Laurence. George Cashell, of Shallee House, Co.Tipperary. Julie Going, of Liskeveen House, Co.Tipperary, and of Lr Leeson St, Dublin, widow of the late Samuel Murray Going. The deed also refers to the will of the late Ambrose Going of Ballyphilip, Co.Tipperary. Henry Dwyer, of Newport, Co.Tipperary, M.D., and his wife Margaret Armstrong, dau of Rev. Anthony Armstrong. The deed is also witnessed by Anthony Armstrong of Limerick. (todo) see apparently related [LR] 1883, vol.14 no.182. of Shallee, Nenagh area, Co.Tipperary, listed in [Slater's Directory, 1856]. listed as owning 400 acres at Shallee, Silvermines, Co.Tipperary, in [Owners of Land, 1876]. see Irish Times, January 1, 1914. George Cashel of Shallee, Co.Tipperary, went to New Zealand. These seem to be related to Cashel of Bedford House, Co.Kerry. Franklin of Greenhills are connected to Cashel of Bedford House, Co.Kerry. she died 1910, age 62 yrs [grave]. Arthur Cashell, of Tralee, fl 1827. George Henry Cashel, bapt 13 Mar 1827 [Tralee Protestant par records]. will pr 1760, think burnt in Four Courts 1922.
listed in [Hickson, 1874] as one of the characters of Tralee at end of 18th cent. referred to in [Rowan, 1860] as being an admirer temp 1805 of Sarah Isdell, governess pre-1811 to family of Sir Edward Denny, 3rd Baronet. George Cashel (his existence implied by the use of "senior"). George Cashel, Marine Lodge, Kenmare, Co. Kerry, was Executor of will dated 1834 of George Cashel, proved in Ardfert Diocese, (todo) see [NAI] IAR/1834/F/39, Volume Name 4/237/34. Francis Cashel, bapt 7 Apr 1796 [Tralee Protestant par records]. [The Kerry Magazine, 1856, p.128] refers to the racehorse Governor, which horse was located in Tralee temp 1786, purchased from "old George Cashel for 50 pounds a year, terminable on the life of the present young George Cashel". she is NOT the Ellen Cashill whose death was registered 1876, Kilmallock district, [GROI]. See miscellaneous Cashel of Co.Limerick.